Another clear freezing cold night on December 14/15th 2008. I was on the look out for lunar atmospheric phenomena because a weak warm front was due to arrive the following morning and with it I expected to see some high level cloud which should be rich in ice crystals ahead of the front's arrival. Like clockwork, bands of icy cirrostratus strips arrived from the NW. A weak halo formed, however between 03.00 and 03.40 UT thicker cloud arrived which produced the best show of the night. A perfect 22 degree halo formed around the waning full Moon (two days after full) sporting red and blue colours. It was an extremely bright ring and surprisingly thick so I headed out into the frigid night to take a few images. These are all at ISO 200, F/4, with a 20 sec exposure. Castor and Pollux are to the upper R of the Moon. Canis Minor with Procyon are below. 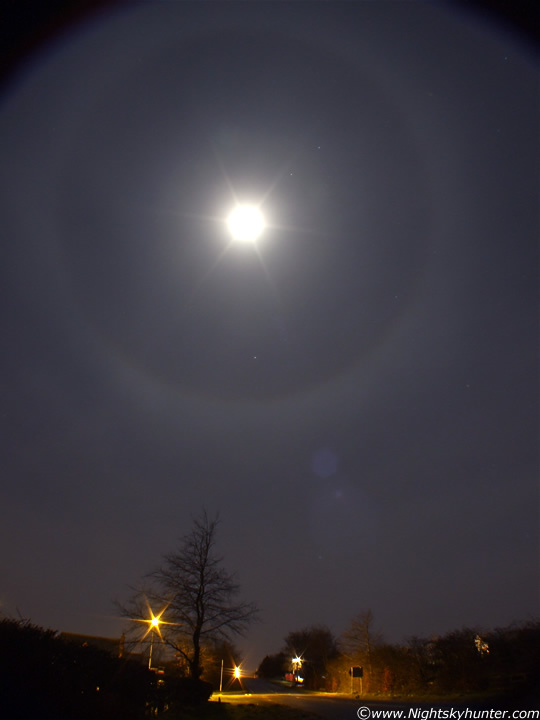 There is another smaller halo inside the large halo near the Moon called a 9 degree halo. Observed some nice Geminid meteor activity too, I was hoping to catch one inside the halo. Here I'm using the 58mm super wide angle conversion lens attached to the 28mm. All those lens elements cause nasty lens flares on the image. The vertical height of this image takes up 120 degrees of sky. Looking SW along the Coleraine road which was white with frost. I only seen two cars the entire time.